Nancy, with a writing student. 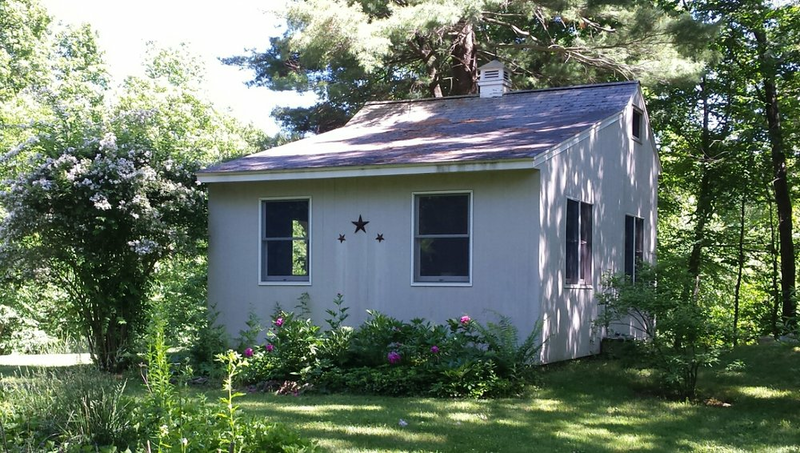 Nancy's studio, which is tucked behind her home in Bethlehem, Connecticut. Nancy McMillan’s award-winning book, March Farm: Season by Season on a Connecticut Family Farm chronicles, through essays, photos, and recipes, the life of a working four-generation farm in Bethlehem, Connecticut. A recipient of the 2017 Eric Hoffer Award, it was noted as a “wonderful book” by Connecticut Magazine. Nancy’s work has appeared in Edible Nutmeg, Litchfield County Times, Register Citizen and Republican-American. She is co-author with Gretchen Trapp of the theatre piece, "Clara Schumann - A Passionate Spirit,” in which she performed in 2003. She is currently at work on a novel. She teaches writing classes at Arts Escape in Southbury, Connecticut. For twenty-five years, Nancy has taught piano privately in her studio, Whistling Hawk Studio. She lives in Bethlehem, where you will often find in her backyard at night gazing at the moon, or in the kitchen baking a pie. Thank you, as always, for stopping by my little corner of the world. If you have any suggestions or thoughts about my monthly book talk please let me know in the comment section below. I'm always open to new ideas!